A trip to US wouldn't be complete without a visit to the sin city.From SantaClara it was a 530 miles drive and most part was through barren deserts of Nevada. Both of us were eager to visit ,but due to the issues we faced with car on the Yosemite trip ,we were bit hesitant to drive this long.The other option was to travel by air or a mix of flight and car. When we checked the rates it was around 450$ per head for direct flights from SanJose to LasVegas and back. Other option was to fly till LA ( 80$) and take a rental car from there for 4 hours. Here too car rent was around 250$ for 4 days.It wasnt affordable and hence decided to stick to car for the entire trip.After Yosemite trip we changed the car to a same model ( KIA Forte) with different colour. During preparations colleages in US office were very helpful .Inspite of their busy schedule Sandeep,Ratnesh,VijayAsokan & Josephine spent a lot of time explaining what to do and more importantly what not to do.They spent so much time that i literaly felt embarased for wasting their time.Sandeep gave a crisp writeup on what places to visit and more importantly what should be skipped( attached with this blog). Since there are number of casinos / hotels , visiting all of them will simply drain our time and energy.Since we are short of time any small mistake would have ruined our plan.We had long weekend for labour day( 3 days) and we made it even longer by adding couple of more days ( Friday and Tuesday) and made it 5 days affair.2 days were exclusive for travel which left 3 days for Vegas and Grand Canyon.Booked rooms at Exacalibur. It came to around 400$ for 3 days.Later extended to 4th day for 40$. Apart from this charges they charge 15$ for using the amenities.We could have take taken other hotels far away from the strip which would have been cheap. But being in the strip saved lot of time and energy. We started on Friday( 2 Sep) morning 5 AM from home .We stopped only for lunch and fuel , a total of around 40 mins.Driving , drive and still drive. Quite tiring.The entire stretch was barren and temprature raised to 100F as we approached Nevada desserts. We had sun screen lotions and sun glasses , which helped to reduce the effect of hot sun on us.We reached Vegas at around 2:30 just in time to checkin into the hotel at 3 PM.A long queue awaited there.After waiting for around 20 mins checked in and took a room at 15th floor.Room was neat and meet our expectation. Lucily we didnt choose the LA route. On the day we traveled there was a fire on the highway connecting LA and Vegas and traffic was disrupted.We could see the smoke fumes when we were traveling but could find the reason only on watching TV at the hotel.Took rest till 7 PM and started for the casinos. We have heard that water is the elixir of life.But it seems Beer and Margareta (a cocktail made mostly of vodka) were the elixir of Vegas.Luckily we had carried lot of water as per Sandeep's guidance ( a 10 litres can , a 5 litres can & 18 * 250ml bottles).Entire cost of these came to around 6-7$ in SantaClara. At vegas at the strip one 250 ml bottle was sold at 1$ and withing the casino it was 1.8$. Frist couple of days the heat was intense . I used to pick margarita to keep myself cool.It was made of crushed ice filled with vodka and flavors of our choice.We can sip it for long time and keep us hydrated.These bottles used to be really big . Medium sized one which i picked once was as high as my knee(cost 11$). First day we visited couple of casinos Luxor , Mandalaybay. .
Its very easy to accept these rules in gambling but not in stocks.We tend to think that short term movements in stocks due to some logical reason and fail to accept the underlying randomness. Since we had a very tight schedule we couldnt play much .We played at max 5$ in each casino. We should have made bets worth 75$ and expectedly on most occasions lost and made big on few bets.Finally the tally was a profit of 20$.At last someone is returning from Vegas with money :) . At each casino i would bet till the last cent and print out a voucher.These voucher can be redemed for cash at vending machine.But i chose to keep the 1 cent vouchers as souvenirs. 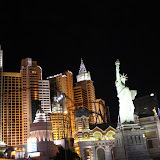 Concept of LasVegas was itself mindblowing. The entertainment hot spot for the entire world , created right at the middle of a desert.Who in his sane mind will think of it. Where do they get water for these hundreds of thousands of people who visit daily.If you have watched God Father ,you would know by now how casino business were created.During the later part of last century when the law enforcement tighened their noose around the mobs ,they wanted to move into legitimate business of high returns .Casinos was the prime among them. There were number of casinos. It would have taken a full week to visit each of them. We choose the ones marked as "must vist" by sandeep.They were really awesome. Grandness of each of them was mindblowing. Ceaser's palace , Venetian had replicated hot spots in greece and venice. Inside venetian there is a boat ride similar streets of venice. NewYork NewYork has replicated must see places in Newyork. On the 3rd day we planned for a trip to GrandCanyon.We decided to visit south rim and it was 4 hours ride from Vegas.We booked with a bus tour paying 80$ per head.Due to labour weekedn it was highly crowded and started from vegas at 8:30 delayed by an hour.On the way we visited the Hoover Dam built on the Colorado river. Next stop was at the National Geographic museum where we saw a short film(35 mins) on the Grand Canyon(15$) on a iMAX theatre. National Geographic movies used to look splendid on a 32inch TV itself. No prizes for guessing how nice it will be on a imax theatre. Impressive movie hall and even more impressive moive. Then we moved to south rim where had just 2 hours to cover this spectacular 7th wonder of the world.Clock was running ahead of its usual speed. Relativity :). I could have sat for hours looking at this god made wonder.Completely lost track of time and after last minute frantic walks finally we reached the location bus was supposed to be parked but couldnt identify the exact spot. After few frantic calls to the driver we reached 15 mins later to the bus.We had one more companion to be late and he too was a Indian :) Finally showed them what IST was. It was quite a surprise, everyone was sticking perfectly to the time.In my past experiance i have never seen a meeting/trip start sharp on time even in (supposedly) highly disciplined software compaines. Definitly a point to improve for us. One thing regret missing there is the helicopter ride. For a cost of 120$ or so ,they will take you from the top of the canyon all the way down , land near the river and then comeback , all in 30 mins. We didn't book ahead and really regret missing it. 4th day visited the left over casinos starting from 10 AM .Visited most of the leftover casinos.Had buffet at Harrah's.By 6 PM we were worn out and returned to hotel.Kumaran was completly down and decided to rest at the hotel.There were 2 more must see spots which were very far by walk. So took the bus (called as deuce) and went to Fremont street. This was supposed to be down town of vegas. Few old styled casinos were there. It seems casnios started here and when the goverment wanted some norms to be followed , the mobs moved out of downtown and selected a outer place ,which now became the strip. There were comparitively few visitors the this street. Fremont street was nice with live shows going on the streets.Entire street ( 200 meters long ) was covered by large screen(lcd) which was good to watch. Now the only left over place was the Casnio Stratosphere and time was 12 PM. Though 12 PM was not a time to rest at Vegas , this casino was outside the strip and roads around them were deserted and i had no company either. After much back and forth thought finally decide to visit this too. The speciality of this casino is that there is a hall at 108th floor which can accessed by payment(16$) and few amusement rides there. I took ticket for entry and any one ride and went up. View from this hall was mesmerising. Entire city of Vegas can be seen at one shot.Huge hotels looks at miniatures at this height.You need not raise your head to look at the moon. I choose a ride called as insanity .Its a ride where we take hoirzontal circles at high speeds. The catch is that the revolutions are made outside the building ie) literally at a height of 108 floors.quite wonderful. There were 2 more rides . I wish i could have taken these rides unlimited(34$) if i had time and company. Another thing which i missed is the gun show. There was gun show where you can view all guns , handle it and even fire live bullets from it.It was far from the strip and i couldn't find time to visit it.